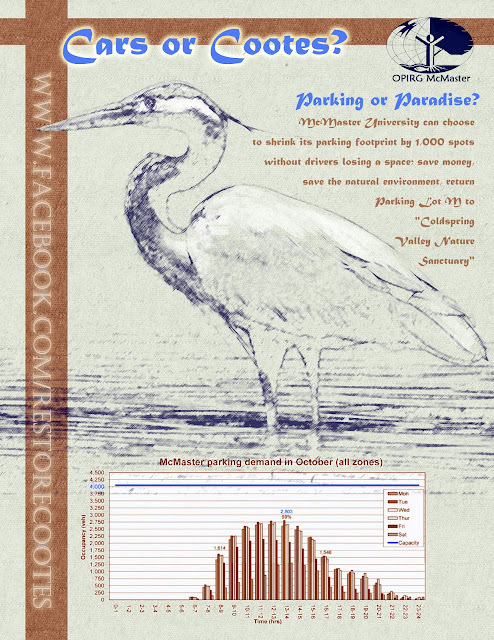 We have a new poster for raising awareness about the opportunity to turn paved parking lots back into healthy wetlands next to Ancaster Creek in McMaster's "Lot M" on west campus. We encourage you to join our Facebook page and stay actively involved. If you are able, print a poster off and put it up somewhere! If you want some to put up, you can contact Randy at 905-525-9140 ext. 26026 or e-mail dundastard@gmail.com for free posters. Thanks to volunteer Aili Wang for the poster design!